MedCorp is a fictitious corporation that specializes in producing medical journals. Independent writers submit their journals to a designated location. Before the journal were submitted via email, but with growing document sizes and increasing number of documents has become difficult to manage. MedCorp looks at SharePoint as a solution to their document management problems. SharePoint is installed and they start adding documents to it. The next issue is that none of the publishers can find the right documents and they seem to be all over the place. The documents didn’t have a standard naming convention so the publishers had to open up to documents to determine what type of journal they were. We will take this business use case and do step by step solutions to make their process into an efficient and successful solution. Document classification – Your one classy document! Since the users are dealing with different documents they should attempt to classify the documents so they know what they are dealing with. Just like an organization chart try building this for the types of documents that you’ll receive. 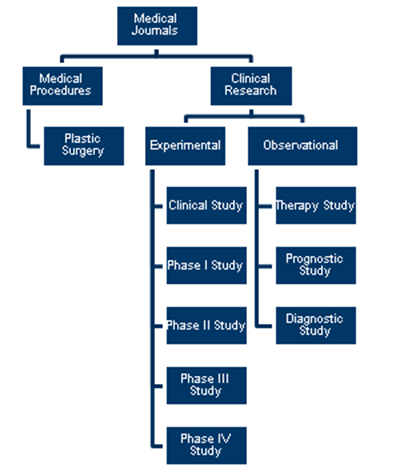 There are two main areas that MedCorp journals pertain to Clinical research and medical procedures. Within these two areas there are different phases and report types. Now that we have defined our classifications let look at what attributes these document have in common. At this point the list can go but some of these attribute if not all will become metadata that will be associated with the documents. Also we will not go in-depth with clinical trial documents (we are trying to show quick wins with document management system). To help out our document reviewers we need to give them enough metadata about the document so that they can tell what the document is about. Also we need enough metadata to implement and make the document easier to find later. The purpose of a content type is to define the structure and possibility behavior for a specified piece of content. For our users the content will be a document. We will be defining metadata (this data will help describe the information within and about the document). Think of this we get a package with labels that gives us enough information to do something with it. We don’t need to open the package and look inside to figure out what it is and what to do with it. We are going to build two SIMPLE content types. (There are definitely different ways to build and inherit be we are going to keep this simple.) By the way yes we could have defined the metadata within the document library but that ties the document to that document library and limits the functionality that will be used later. Click site content types, the screen will go to site content types gallery next click create. The content type has been created we need to add the additional metadata fields. File name and title come as defaults because our content type is inheriting from the document content type which already has these fields defined. 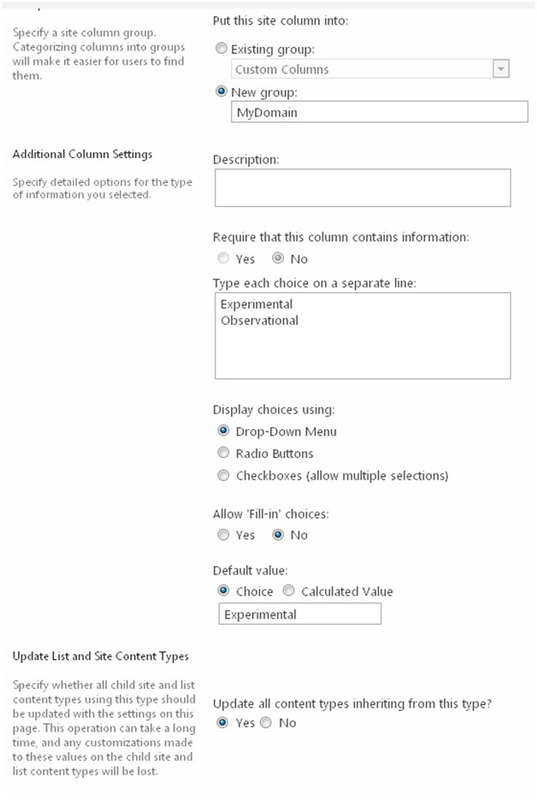 There are two options to add additional site columns one is to reusing an existing and the other create a new the site column. 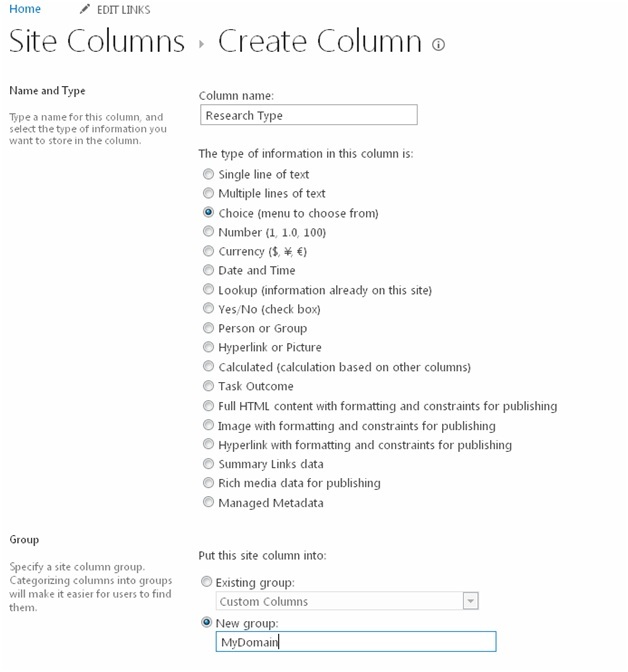 Site columns are columns that are accessible to all the sites within the site collection (so any site under and including https://my.sharepoint.com/sites/mysitecollection will be able to reuse this site column structure). 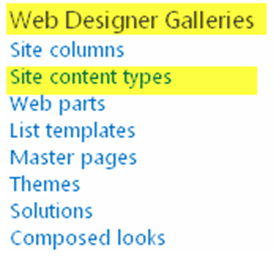 Subject already exists as a site column (SharePoint comes with many default site columns). Scroll down Available columns and select Subject. 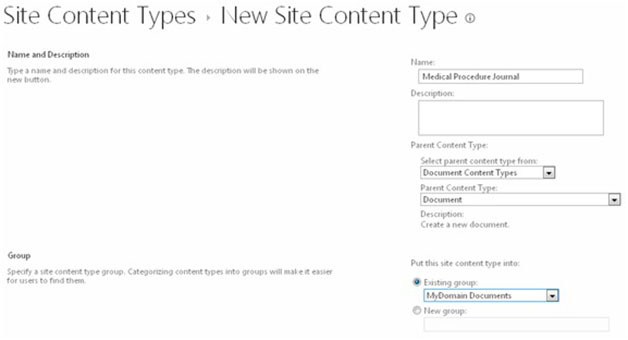 To make site columns that you define easier to find create a new group for them. Type your choices in the designated area. Since this data is important it will be a required field that the person uploading the document will have to fill out. Click Ok to add the column. To make this a required field, click on the column name to update the column and make it required. Do the same steps for Medical Procedure Journal content type. 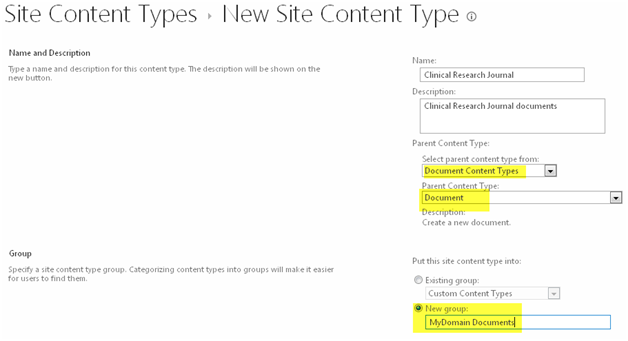 Don’t forget about using MyDomain as the Existing group for the content type grouping. Hip Replacements. Also make this a required field. Where to put that Document, Drop it Off here! Now that we have the content types we need to apply the content type to a document library or libraries. We will create a special type of document library for these documents. A document library that will automatically move the documents to an intermediate or final location depending on your process flow. Please lookout for our next article on how to use Drop off Library for effective implementation of ILM.